mmsonline.com October 2017 MMS 79 FEATURE P roducing functional parts via additive manu- facturing (AM) enables us to design and manufacture products that we just can't make any other way. With the flexibility of 3D printing, we can realize part-performance benefits such as lightweighting and thermal efficiency, we can integrate separate components into consolidated designs with complex forms, and we can do all this within a build process that is of ten highly automated and highly efficient it its use of mate- rials, producing little waste. AM has a dark side, however. The benefits above are of fset against some ver y real and potentially painful challenges with postprocessing. Finish machining of AM parts can be challenging directly because of their light weight and their complex forms. Both attributes can lead to prob- lems with workholding and vibration and can result in poor process yields. Furthermore, there is the additional problem of aligning complex compo- nents when they lack precise geometric datums in the as-built state. Meeting the Machining Challenges of Additive Manufacturing You can 3D print the part, but can you finish it? Here is how to overcome the challenge of part deflection in the machining of lightweight, complex AM parts. BY M A RC SAU N D E R S , R E N I S H AW The geometric complexity of a 3D-printed part might mean special workholding is necessary for machining it—perhaps workholding that is 3D-printed as well. 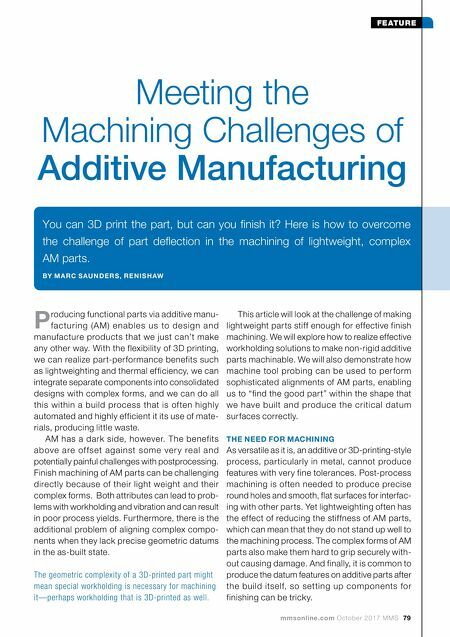 This article will look at the challenge of making lightweight parts stiff enough for effective finish machining. We will explore how to realize effective workholding solutions to make non-rigid additive parts machinable. 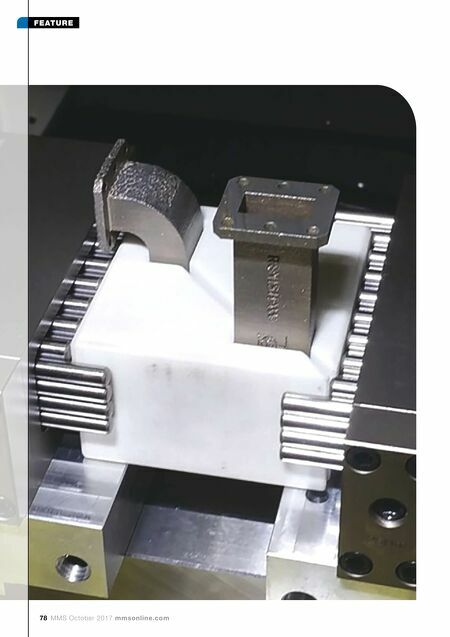 We will also demonstrate how machine tool probing can be used to per form sophisticated alignments of AM parts, enabling us to "find the good part" within the shape that we have built and produce the critical datum surfaces correctly. THE NEED FOR MACHINING As versatile as it is, an additive or 3D-printing-style process, particularly in metal, cannot produce features with very fine tolerances. Post-process machining is often needed to produce precise round holes and smooth, flat surfaces for interfac- ing with other parts. Yet lightweighting often has the effect of reducing the stiffness of AM parts, which can mean that they do not stand up well to the machining process. The complex forms of AM parts also make them hard to grip securely with- out causing damage. And finally, it is common to produce the datum features on additive parts after the build itself, so setting up components for finishing can be tricky.